Noted for their commitment to social justice and invigorating neighborhoods through urban design, Landon Bone Baker Architects (LBBA) has been named the 2014 AIA Chicago Firm of the Year. Established in 1991, the award recognizes a single firm’s outstanding achievements, consistent excellence and ongoing contributions to the advancement of the architectural profession. "Landon Bone Baker Architects embraces the challenge of building for the neediest members of our society and accomplishes it contextually and sustainably on minuscule budgets...but with great architectural integrity," a juror said. Driven by the credo that "good design is for everyone," LBBA has been improving the urban condition through incremental interventions in the cityscape since its founding in 1987. Principals Peter Landon, FAIA, Jeff Bone, AIA and Catherine Baker, AIA, and their team work to produce buildings and plans that translate the principles of public interest design - a participatory design process meant to equate ecological, financial and social costs - into reality. 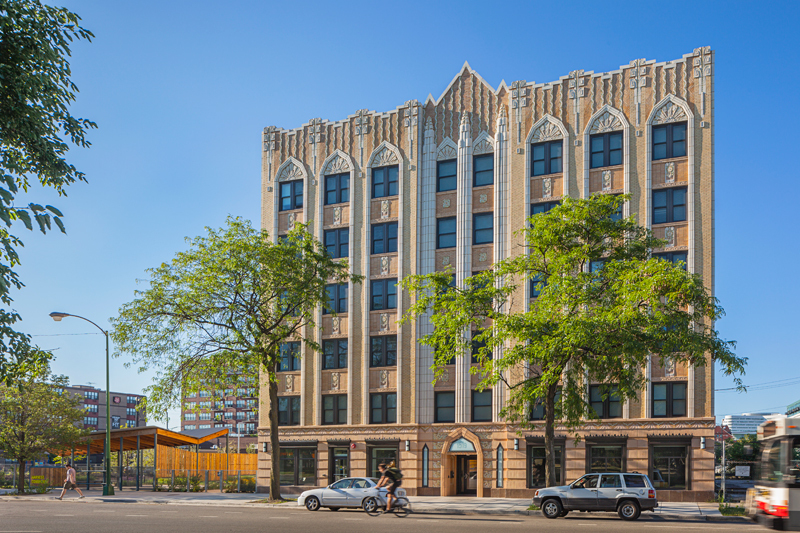 The firm's portfolio includes the revitalization of numerous Chicago Housing Authority (CHA) developments, including Chinatown's Archer Courts, the Near North Side's Parkside of Old Town and Greater Grand Crossing's Dorchester Art + Housing Collaborative, a transformation of the former CHA Dante Harper Housing Project and a collaboration with Theaster Gates and his Rebuild Foundation. In 2013, Harvest Commons Apartments, a transformation of the transient Viceroy Hotel on the city's West Side redeveloped with Heartland Housing, was honored with a Distinguished Building Award at AIA Chicago’s 58th Annual Design Excellence Awards. The project, which includes 89 below-market affordable housing units and an additional 17 units of transitional housing for women recently released from prison, is a rehabilitation of a classic Art Deco building that had fallen into disrepair. LBBA is "a Chicago firm, working in the local idiom, respectfully," a juror said. The firm employs an outlook that "not just downtown buildings will save the city," another juror added. This belief in the power of community-driven planning to enact equitable and livable design standards at the human scale is further evidenced by the neighborhood-based programs the firm runs. The LBBA Community Workshop is a summer program for high school students and college-age mentors interested in design. The workshop provides an entry point for young designers to participate in community design and empowers local residents to affect their environment through the design process. Landon Bone Baker Architects has hosted four Lab programs through the LBBA Community Workshop to date: ShadeLab, airLab, airLab 2.0, and cityLab. Join AIA Chicago in honoring Landon Bone Baker Architects and celebrate their award at AIA Chicago’s joint holiday party with SMPS, on Monday, December 8, 5pm, at Studio Paris, 59 W. Hubbard St.